Yeah, mine didn't have the rubber protector on either of them, just the ones that came in the sealed package which were easy enough to put on. Did you have any issues connecting them to a 2nd device? I am at work right now so I do not have the manual, but the way I was expecting it to work is not currently opening it up for Bluetooth discovery. They were easy to put on. The smallest ones are definitely way more comfortable. I had 0 issues connecting to a second device. I initially paired with my work computer (Mac Pro), but I think there's something wrong with the bluetooth on it. All headphones I connect are really crackly. I discounted the Neos from the bluetooth settings and my iPhone instantly found them. I just tapped on the name in the bluetooth setting and they paired right away. Perfect connection and they sound fantastic! Do you guys remember if anker asked for shipping address in the google form? or they use the address in our profile? Shipping address is what was asked for. I received a text to the phone number I listed in the form from DHL showing the shipment in Hong Kong and all the paths along the way. That's my issue right now is it is not being discovered by my laptop. Is there anything you have to press on the action buttons (length or combination) to get it to go into discovery mode? Not that I recall. You may want to put them back in the case and take them out again. Or forget the connection on your other device and start with the laptop. Have you tried pressing in on the Soundcore logo to see if that activates pairing mode? Yeah, that was my first guess to do was to unpair it and then forget the connection on my phone. Put them back in and pulled them out and it is not showing on the laptop still. Probably a driver on it, so I will have to mess around with it to see. That's so weird. 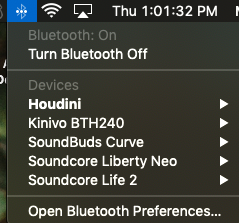 When I went to bluetooth preferences on my computer, they showed up right away and paired within seconds of clicking on them. Maybe try the old computer restart method and see if that helps? Glad to hear it wasn't the Neos. I love the fact that I can have a nice collection of bluetooth headphones linked to my computer. Houdini is my Magic Mouse, but the rest are headphones. I've already gone through one charge on the Neos and started charging them 2 hours ago. Do we know how long they take to get back to a full charge? From what I was reading, 1.5 hours for a full charge, which was about what I was at when I charged mine last night. Just a stock Samsung fast charge block and the provided wire and they were good to go. When it comes to using the case to charge them, I am not 100% tbh. Nice video! Keep up the great work! I personally like the texture of this charging case. Anker Marketing Team replied my email and provided the tracking number. I hope it will arrive tomorrow. The rubber protectors of both left and right ear are in the same bag. Please check it again and if you're still missing that part, you could reach out to support@anker.com directly. I checked and it’s not in the bag, but after using them with the additional pieces, I realized that I don’t need it. Thanks for the info! I’m loving these!